You may remember from this post that I’ve been waiting over four months to see The Intern, ever since I first saw the trailer. John thought it looked funny, too, so we went to see it yesterday. (It opened Friday.) It was SO GOOD!!!!! Starring Robert De Niro and Anne Hathaway, 70-year-old Ben has decided retirement is too boring so he applies for a job as a senior intern at a super-successful Internet fashion startup company owned and run by Jules, a woman trying to balance everything in her life with limited success. The differences between the older characters and younger characters felt realistic, yet sweet and funny as they all tried to learn from each other. Writer/director Nancy Meyers had so many opportunities to follow other filmmakers who try to make their characters believable by making them “raw” or “realistic” – and she didn’t take them. This movie will not leave you with a bad taste in your mouth at the end. It was so refreshing to see people making bad choices and then recovering from them rather then wallowing or taking the easy or selfish way out. Everything about this film is smart and funny and clean. It’s not a romantic comedy, of course, but it’s a great comedy with some unexpected romantic elements. (Hint, gorgeous Rene Russo is older than she looks, and her and De Niro’s characters make you feel like getting older is still going to be fun.) The audience in our theater laughed a lot, and there is a heightened joy when you share laughter, so that made the whole experience even better. I wanted to see The Intern again as soon as the credits started to roll. Like Saturday’s review of The Age of Adaline, this one is 5 stars, two thumbs up, and a high five. 😀 I am absolutely buying both of these movies on DVD! LOL! Please, give yourself a relaxing break and see them – and take a friend! This entry was posted in Books and Movies and tagged Anne Hathaway, comedy movie, great movies, Kitty Bucholtz, movie reviews, Rene Russo, Robert De Niro, The Intern on September 28, 2015 by Kitty. I wish I could remember who told me to see The Age of Adaline – so I could hug her! I’ve been busy so I don’t remember watching the trailer when the movie came out in April. Also, reading the description on IMDB made me think this was some slow, boring, “literary” type of movie, which I’m rarely in the mood for. But the other night John was out with his friends and I walked by a Redbox at the grocery store and didn’t see anything else that I wanted, so I said, why not? I am so glad I rented this movie!!!! The best part was that there was no “Nicholas Sparks moment.” A couple times I had to brace myself thinking, oh great, this is probably the scene where someone dies and the whole thing is ruined. But it didn’t happen! And a couple times I braced myself thinking, oh great, this is probably where so-and-so is a royal jerk and ruins the tone of the whole movie. This entry was posted in Books and Movies and tagged great movies, Kitty Bucholtz, movie reviews, romantic movies, The Age of Adaline on September 26, 2015 by Kitty. Here’s another edition of “More Movies I Can’t Wait to See!” Haha! I hope you’re enjoying watching all these trailers and planning your movie-watching calendars. (I am!) Click on the movie title to see the trailer. Enjoy! This movie looks so ridiculous and hysterical! John and I laugh when we see the trailer every single time! A whole new take on alien invasion. This is going to be so fun! You know how some trailers really make you want to see a movie and when you do, you realize the movie is nothing like the trailer? Well, we’ll see. It’s got Meryl Streep in it, so that’s a big plus. And there’s a great line: “It doesn’t matter if your kids love you. It’s not their job to love you. It’s your job to love them.” For now, this trailer has got me interested. Of course, I know I’ll be seeing it alone. Not a John kind of film! Haha! I was practically jumping up and down in my chair when I first saw this trailer! I didn’t realize they were making a movie. Our friends in Australia got us hooked on Shaun the Sheep. The cartoons are hysterical. Same people who did Wallace & Gromit and Chicken Run. It’s gonna be great! I first saw this trailer accidentally back in mid-May, and I’ve been all but foaming at the mouth waiting for it to come out! 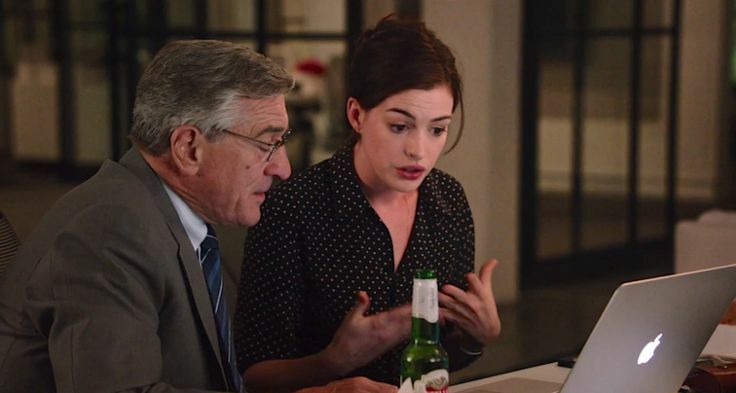 Robert de Niro is the intern and Anne Hathaway is the boss! How’s that for a turn-around? Watch the trailer. You’re going to want to see this one! I’ve already got chick-flick plans with a girlfriend – woo-hooo!! This entry was posted in Books and Movies and tagged futuristic movies, great movies, Kitty Bucholtz, romantic comedy, sci-fi movies, superhero movies on August 3, 2015 by Kitty. I already told you about a lot of the movies I’ve seen this year, but when I was watching Tomorrowland, there were so many trailers for more movies I want to see! Some look amazing and I know I’m going to love them. Others have piqued my curiosity enough to want to try to see them if I can. Click the movie title to see the trailer. I couldn’t decide if it was the Emma Stone storyline or the Rachel McAdams storyline that made me want to see this movie more. But I decided to use some of my birthday gift-cards-for-chick-flicks to see it. It was definitely a Cameron Crowe film – his stories have a unique touch all his – so it wasn’t really a romantic comedy. But I enjoyed it. Good story, great acting. I’ll just start by saying, John will see anything with Sam Rockwell in it, and I’m right there with him. We had to see this movie. Unfortunately, we got busy with a bunch of things when it came out and when we finally had a minute to see it, it was out of the theaters. We’ll either catch it at the discount cinemas, or at Redbox. Bummer. I would’ve loved to get scared in the movie theater! I love Jeremy Piven. That’s part of why I let John convince me to watch the TV show with him years ago. But then all the other characters were so weird and funny and interesting that I just kept watching. Since we watched the entire six seasons of the show, how could we not want to see the movie? Again, it was playing for a few weeks, we were busy, we finally decided to see it the next Saturday, and it was already gone. Argh! So…we’ll have to see it at the discount cinema or via Redbox. Another trailer that has me laughing every time I see it! There’s always a little fear that I’m going to expect more from a movie than it can give due to an excellent trailer, so I tried to keep my expectations moderate. But when we saw it, we both laughed out loud a lot. It was just plain lots of fun! Of course, for me in particular, I’ve found the concept funny from the beginning because it’s like my book, Little Miss Lovesick, with all those voices that are given their own names! Hahaha!! I loved Terminator 1 and 2. I had mixed feelings about the others, but I like the idea so I watched all of them in the theater. This one looks especially good! Here’s hoping! Because I am definitely going to see this one. I just have to find the time!! Minions – so many great actors doing voices in this one! I’ve been waiting months for this movie to come out! I only know a little about Ant-Man from reading The Ultimates, but Paul Rudd plays him in a way that is entertaining to me at least. Looks like another Marvel success! I can’t wait! This entry was posted in Books and Movies and tagged futuristic movies, great movies, Kitty Bucholtz, romantic comedy, sci-fi movies, superhero movies on July 16, 2015 by Kitty. I love movies! I love any kind of good story, presented in whatever creative form the artist comes up with. Movies are one of the forms I like a lot. If you don’t realize what good stuff is out there, here is a list of the stories that have caught my attention recently. These are the ones I’ve either seen or want to see. I’ll post again in a week or two about more upcoming summer movies. Click the title to see the trailer. I hope you find some good stories you’ll enjoy! I loved this movie! Strong family values, power of friendship, good triumphs over evil, kid power, etc. So funny!! Loved the story! I enjoyed this movie. It entertained me, which is exactly why I went. The characters played by Colin Firth and Samuel L. Jackson made me laugh. Mark Strong did a great job as the main character. It was just plain fun! I went with friends, which is part of the fun, and I enjoyed it. But I’d recently watched Divergent again (which I loved!) so I could be sure not to forget anything. Unfortunately, several times I thought, “I liked Divergent better.” Still, it was entertaining, and told me more of the story. Best two hours of my movie-watching life so far this year! (At the time it came out.) I saw this one alone and completely forgot myself, the other viewers, the theater – I was so immersed in the movie, I was aware of nothing else! It wasn’t until I left the theater that I realized my cheeks ached from smiling for two hours straight! See it!! Really strange story that kept us guessing the whole time. I didn’t know much about it (which I think helps enjoy a movie more for what it is, not what it’s advertised to be), and I kept getting surprised by what was happening, which led to great enjoyment. Talked about “what if” afterward with John, which is always a good sign that we were really engaged with the story. This just looks fun! I haven’t seen it but I want to. I mean, come on, Jim Parsons – who plays Sheldon on The Big Bang Theory – plays the alien! What’s not to like? BEST MOVIE THIS YEAR!! John and I enjoyed this movie so much we saw it twice the first week it opened! As I implied above about Insurgent, it’s difficult to make a sequel as good as the original. But this movie rocks!! Of course, since I write superhero books that have a strong family focus, I loved the family scenes. But the action and the dialogue were just about perfect! We pulled out our three Mad Max DVDs to watch before going to see Fury Road, but we bought them when we lived in Australia, and our International DVD player is packed. Darn! So we watched the new one without having the background fresh in our minds. And it was great! Lots of action, lots of the same kind of fighting I remember from the first three (meaning it’s too violent for some of you), and some great scenes of sacrifice for the greater good. I enjoyed it. I expected a fun Disney movie when I saw the trailer for this. You know, like Pirates of the Caribbean, where it’s just something fun based on a ride. But by the time the movie was over, I was inspired to go make the world a better place, to believe we can make it a better place, even one person at a time. Go see this movie! Take your kids! Get inspired! Change the world! This entry was posted in Books and Movies and tagged futuristic movies, great movies, Kitty Bucholtz, romantic comedy, sci-fi movies, superhero movies on June 3, 2015 by Kitty.